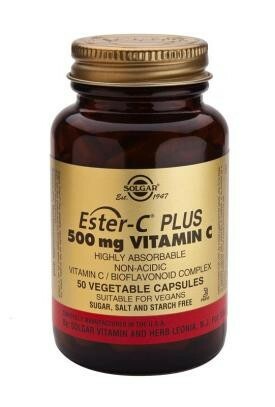 Solgar Ester-C Plus 500mg vegicaps are a highly absorbable, non-acidic vitamin C/bioflavonoid complex. Ester-C Plus is exclusively formulated for Solgar and provides a patented method of supplementing pH neutral (non acidic) vitamin C to prevent digestive irritation. 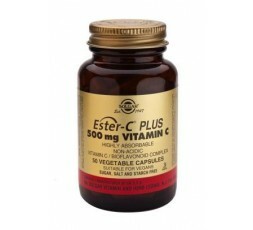 In addition, Ester-C Plus contains the vitamin C metabolites that occur along with vitamin C in nature. Vitamin C is an antioxidant vitamin essential to the body's health and is especially important for maintaining healthy skin. Also known as ascorbic acid, Vitamin C is a water-soluble vitamin. Humans cannot make their own Vitamin C so daily replenishment is essential. Its primary function is to maintain collagen, a protein necessary for the formation of skin, ligaments, bones and teeth, and for the strength of blood vessel walls. In addition, Vitamin C plays an inportant part in the absorption of iron, which is necessary for the formation of red blood cells. It also plays a role in the utilisation of folic acid. Take 1 to 3 vegecaps daily, preferably at mealtimes.